CV parsing, semantic search and matching technologies can be added to existing systems in order to improve the candidate experience and to make it easier and faster for you to find suitable candidates. Textkernel’s technologies can be connected to many different software systems, one of them being Oracle Taleo Cloud Service. As an Oracle Taleo Cloud Service user, you work with a highly customisable system which delivers a lot of value. Still certain parts of the system, such as the application process or internal search and matching capabilities could be improved. Third party providers, such as Textkernel, can replace the extensive online form and add strategic sourcing and matching functionalities. Using long application forms on corporate websites in order to get structured and searchable candidate data leads to high drop-off rates. Your candidates expect a seamless and mobile application process with as few interruptions as possible. On the other hand, you can only use the candidate database effectively if the data is complete, validated and correct. So how can you overcome this challenge? Textkernel’s Apply-with widget combined with Extract! CV parsing replaces the Oracle Taleo Cloud Service online form. Your candidates can apply with just a few clicks from any device without having to log in or manually fill in a long form. In the background, the resume parsing software sends the full profile structured to Oracle Taleo Cloud Service and delivers meaningful data to you. Candidates will benefit from a positive candidate experience which results in lower drop-off rates and more applications. You will receive meaningful data directly in your recruitment system. Textkernel’s semantic Search! and Match! software can be connected to Oracle Taleo Cloud Service in order to retrieve candidates easily from your extensive database and thus delivering a better search experience. On top of that, it helps you to better and more easily find the best candidates in your database. 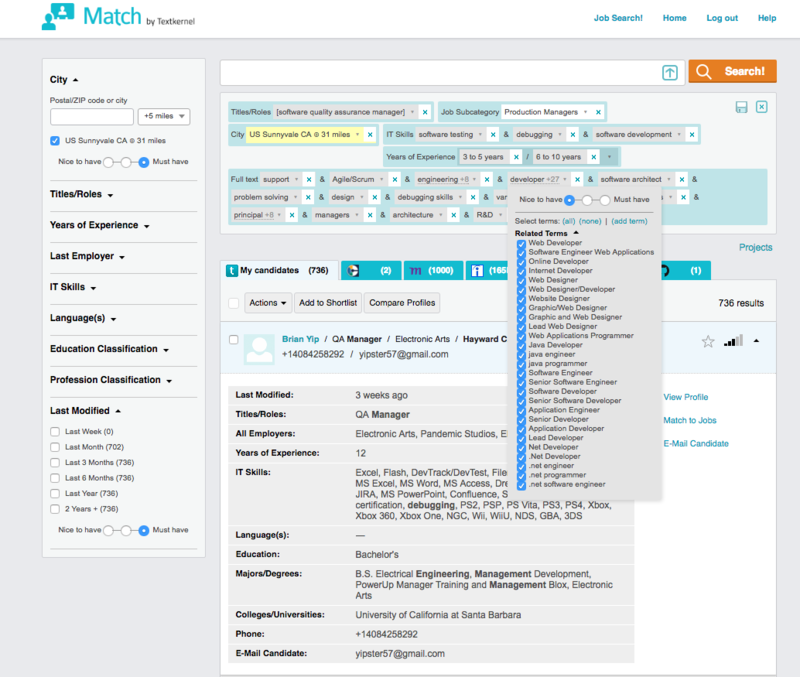 Connected to Oracle Taleo Cloud Service, the semantic search engine can show all your candidates and applicants in the Textkernel user interface. 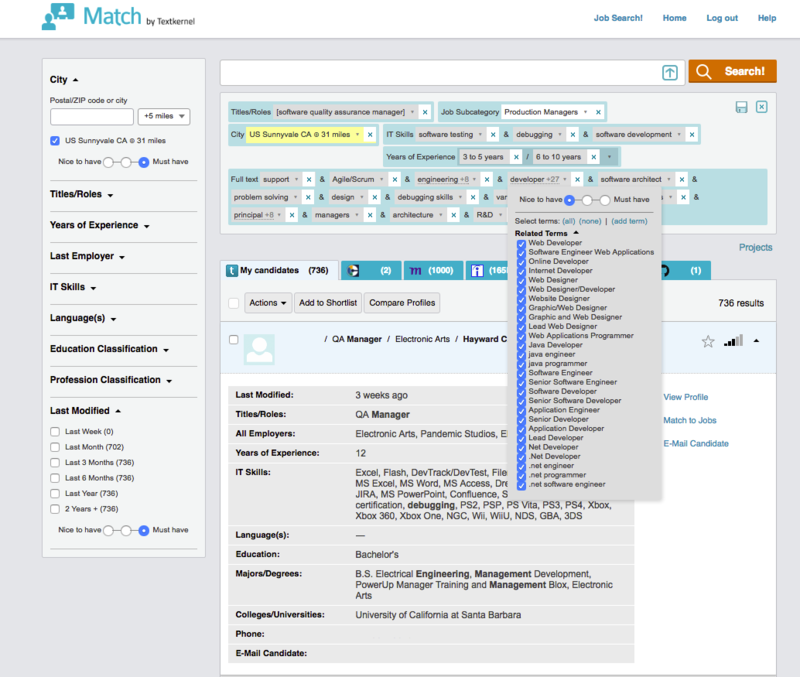 Advanced matching, which links the candidates to the most suitable jobs, and vacancies to the most suitable candidates, ensures less time is wasted on reviewing data and more time is available for the essence of recruiting. Want to find out more about Textkernel’s projects with Oracle Taleo Cloud Service? Contact us now for more information. Every single Textkernel module provides an API which makes it easy to add semantic solutions to your existing recruitment system. Without replacing your existing software and re-inventing the whole wheel, Textkernel can upgrade parsing-, sourcing- and matching functionalities.